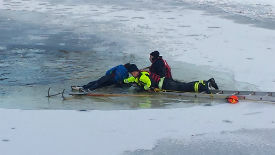 On Tuesday, January 6, 2015, the Downers Grove Fire Department responded to a 9-1-1 call at 3:35 p.m. for the report of an individual who had fallen through the ice and was calling for help. A young man fell through the ice at a pond located in a residential neighborhood at 7100 Dexter Road in Downers Grove. Firefighters arrived to find him trying to stay afloat by staying on his back. Firefighters performed an ice rescue using the skills they practice through extensive training for such incidents. Within five minutes of their arrival, the firefighters were able to bring the victim to shore. He was conscious and was transported to Good Samaritan Hospital. - Observe all signs posted regarding dangerous ice. - Dress warmly and avoid long exposure to the elements during severe cold. - Be aware of early signs of frostbite and get indoors immediately.